Links related to Humangear are listed below. Squeezable Travel Tube. Clear FDA food grade silicone construction. Hinged lid with no-drip valve. Features built-in suction cup. 2 fl. oz. capacity. Carry-on approved. Hang packaged. Made in China. Squeezable Travel Tube. Clear FDA food grade silicone construction. Hinged lid with no-drip valve. 3 fl. oz. capacity. Carry-on approved. Hang packaged. Made in China. Squeezable Travel Tubes. Black FDA food grade silicone construction. Hinged lid with no-drip valve. Features built-in suction cup. 2 fl. oz. capacity. Carry-on approved. Hang packaged. Made in China. Collapsing Travel Cup. Clear FDA food grade silicone construction. Collapses to 2 3/4" w x 1 1/4" tall. Lid features removable pill holder. PC-free, phthalate-free, and BPA-free. Perfect for toiletry kit, backpack, bookbag, briefcase, or purse. Hang packaged. Made in China. Collapsing Travel Cup. Clear FDA food grade silicone construction. Collapses to 3 1/2" w x 1 1/4" tall. Lid features removable pill holder. PC-free, phthalate-free, and BPA-free. Perfect for toiletry kit, backpack, bookbag, briefcase, or purse. Hang packaged. Made in China. 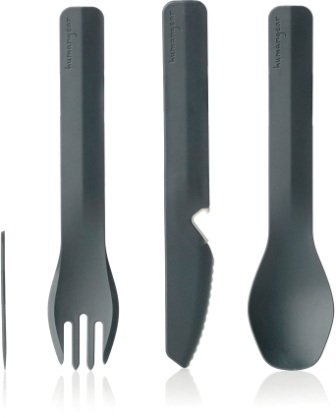 Includes 6 1/2" overall fork, spoon, and sharp knife with bottle opener. Also comes with toothpick. Gray BPA-free nylon construction. Nylon storage case holds all items. Hang packaged. Made in China.